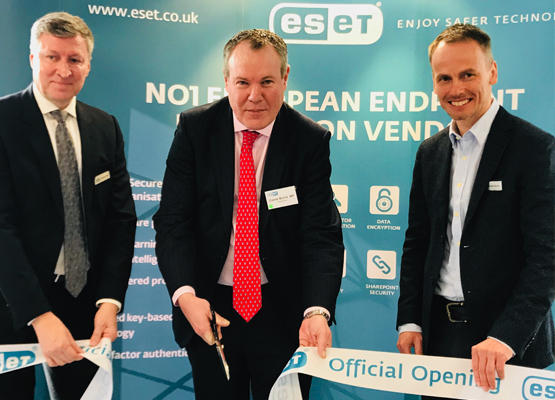 ESET, the number 1 IT security vendor based in the European Union, has launched its new UK HQ in Bournemouth as part of its ambitious plans to grow the company in the UK over the coming years. ESET has recently moved to impressive new premises at Holland House in the Lansdowne area of Bournemouth. Staff hosted a prestigious official opening event and welcomed a diverse mix of guests from across the business communities in Bournemouth, Poole, Dorset and Hampshire. The new office move will enable the company to recruit another 40 staff to its 60-strong UK headcount over the next two years. ESET established its Bournemouth base in 2004 with a team of just 12 staff at their former offices in Charminster. Conor Burns MP cut the ribbon to mark the official opening of the office. Over a period of 30 years ESET has grown in to a global brand with over 110 million users in 200 countries and territories and has 13 research and development centers across the world. It employs circa 1500 staff world-wide.